The triple play is a fairly elusive event. The unassisted variety, of course, is one of the rarest moments in baseball; there have only been 15 of them since 1900. But even the regular, garden variety triple play is a rarity; there have been 18 since the start of the 2013 season. For reference, there have been 16 no-hitters over the same time frame. 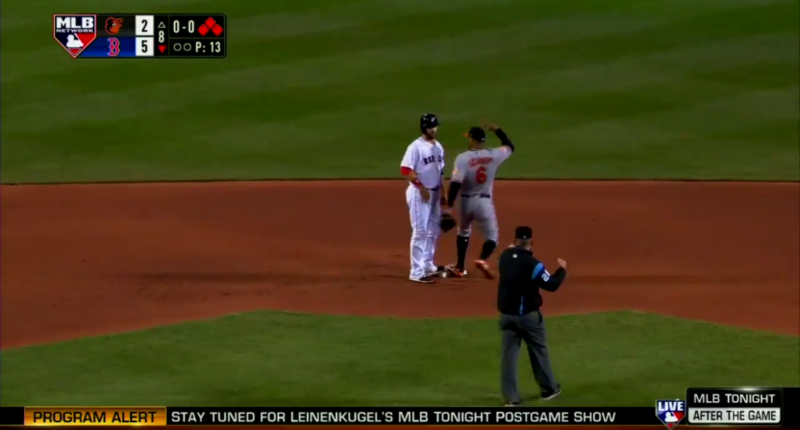 On Tuesday night, the Orioles and the Red Sox were playing a game that had been overshadowed by the controversy surrounding Boston fans hurling racial abuse at Adam Jones the night before. But they did still have a game to play, and in the bottom of the eighth, Boston led 5-2, with runners on first and second and no one out. Bob Costas might have been the most confused man at Fenway Park, which is never what you’re looking for from your play-by-play man. First, Costas said the infield fly rule had been called, probably due to prompting from his partner John Smoltz, but it hadn’t been. Jackie Bradley Jr. was expecting the ball to be caught, or assuming the infield fly had been invoked as well, because he didn’t run down the line. J.J. Hardy was in left field, and it wasn’t a routine play (as evidenced by the fact that he didn’t make it), so it would seem like the umpires were correct by not calling it an infield fly. That meant the ball was live, and all three runners should have been trying to advance. However, none of them were. Mitch Moreland was caught a few steps off second, perhaps realizing too late that he needed to try to advance, but that tag was the first out. Pedroia was forced out by the step on second base, and then the throw to first got Bradley, who apparently had zero interest in running, for any reason at all. It’s rare that no one on a broadcast knew what was happening at all, but the infield fly rule can sometimes be difficult to parse. Costas and Smoltz took their cues from the runners, who were all pretty much wrong, except for Moreland, who was just right enough to get punished for it. In the end, we got a triple play out of it and it was maybe the strangest triple play in MLB history.